Fleet Foxes performed an energetic set at the Arlington Theatre on Sept. 20 and brought fans to their feet to sing songs that addressed serious topics with an easy-going sound. Yet the Fleet Foxes casual nihilism frankly addressed serious concerns by commenting on police violence and the state of politics. The widely acclaimed indie-folk group garnered a striking variety of attendees, from nervous high school couples to hipsters with beards and boots. I saw fathers holding the hands of their daughters and intellectual types mingling with artsy-30-something’s at the merch table, smiling as they held up t-shirts, vinyl albums, and postcards to immortalize the much-anticipated show. Nashville native and opener Natalie Prass, backed by singer-songwriter Matthew E. White, impressively integrated a contemporary sound with a timeless style. During Prass’ performance of her song “Bird of Prey,” she engaged her soulful Southern roots by weaving bluegrass style into her heartbreak rock. Prass expertly combined echoes from an earlier era with powerful, strikingly emotional vocals on “My Baby Don’t Understand Me,” from her self-titled 2015 debut “Natalie Prass.” Her yearning voice mourns the harsh depths of heartbreak, while deep, rhythmic drumming brings out the deep tension of unresolvable love. Together, Prass and White balanced taut heartbreak and raw, ragged rock. They emphasized the band’s range by flawlessly integrating a pop-punk sound into more upbeat songs. The piano-heavy tunes set the tone for beautiful odes to love, sadness, and life. The smoky lighting in the old theater and Prass’ silk white suit, reminiscent of an earlier period in folk-rock, immersed the audience in a time of authentic sadness which Prass and her band comfortably inhabited. As Prass and the band left the stage, the audience returned from its mental reverie to take advantage of the intermission. As figures dressed in black re-arranged the stage and readied it for Fleet Foxes, a new energy entered the theater. The theater swelled to maximum capacity as people returned from the intermission and new attendees arrived. 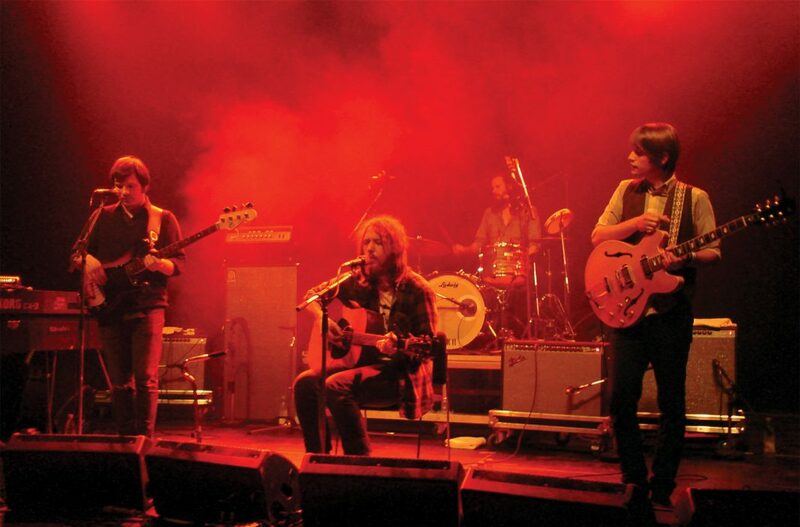 Fleet Foxes, a popular band despite its experiment with unusual sounds, performed songs from their latest album, “Crack-Up.” While “Crack-Up” and all of Fleet Foxes’ discography engages in self-flagellation and deeply questions their own outlooks, the group manages these topics with an artistic, uniquely-formed approach. The result is an emotionally charged exploration of the pains of individuality in a world that rejects the subjective. Troubling lyrical commentaries are balanced with a wide-ranging tone and complex, soothing instrumentation. On “Fool’s Errand,” smooth synthesizer harmonies contrasted with Matt Barrick’s syncopated percussion. Pecknold sang on “Third of May / Odaigahara” and offered self-reflections that revealed an internal rift that plagued his mind. The complex and stunning talent of cellist Dave Eggars and Pecknold stood out, yet the sound was integrated in the various tones of Fleet Foxes. The band’s tone reached beyond the typical sounds of folk-rock to create a refreshing yet dark image of our collective political environment and our problematic responses as individuals. In a solitary spotlight, Pecknold poured his heart out before an entranced audience. The audible pain in his voice struck the crowd in a near-tangible wave. As Pecknold’s ominous crooning filled the hall, one couldn’t help but feel the sheer depth of his pain. The rest of the group rejoined him on stage, and faster songs with more popular appeal brought people out of their ruminations. Once again, the cozy lighting and energetic band brought the crowd to its feet, this time swaying in time to a deep, thrumming bass. As voices joined in to sing the songs, a friendly warmth spread through the darkened yet connected hall. Fleet Foxes maintains an impressive spot at the forefront of Indie rock through well-placed experimentation with sound and composition. For the audience, the band engaged challenging, relevant topics with a serious sound while holding onto hope which offered an honest, freeing expression.